The Prime Minister has just announced at a NATO news conference that the second new British aircraft Carrier HMS Prince of Wales will be commissioned into service, ensuring “we always have one carrier available, 100 percent of the time”. This will put to bed years of speculation over whether the ship would be immediately mothballed or sold abroad upon completion due to cost concerns. Speaking about Britain’s investment in military hardware, the PM said: “Here in Britain we have the second largest defence budget in NATO, we have the biggest in the whole European Union. We have taken long term, often difficult, decisions to put our defence budget on a sustainable footing. The fruits are now coming through”. He quoted a number of recent big-spend military projects, including the Astute submarines, new aircraft for the Royal Air Force and the recent announcement of a new tank-building programme for the Army, the which he called the largest such investment in thirty years. Discussing of the decisions reached at the NATO conference so far, the Prime Minister was robust on what needed to change in the alliance, and singled out the low spending of some NATO members. Each member state has a treaty obligation to spend two percent of GDP on defence, however in reality very few do. The Prime Minister has today announced that is to change. Speaking in Wales he said: “With today’s Wales pledge, every NATO member not spending two percent will halt any decline in defence spending, and they will aim to increase it in real terms as GDP grows and to move towards two percent in a decade” adding “a fifth of defence budgets should be dedicated to major new equipment”. 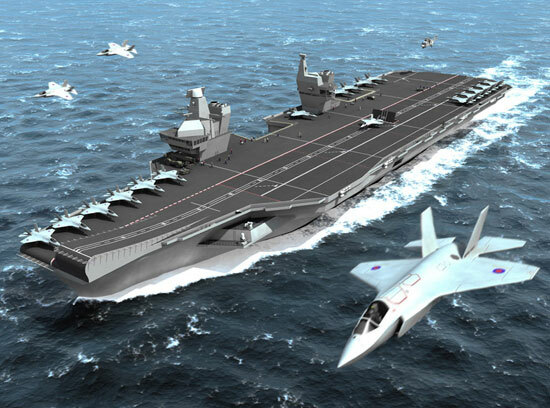 HMS Prince of Wales has been the subject of intense speculation since the Strategic Defence Spending Review of 2010, which placed the future of the Super-Carrier in doubt. The spending provisions made allowed for one carrier to be operational at any one time, and rumours persisted that the UK would take a French approach to carrier strike, maintaining only one ship and selling or mothballing the other.